“We reached the old wolf in time to watch a fierce green fire dying in her eyes. … I was young then and full of trigger-itch; I thought that because fewer wolves meant more deer, that no wolves would mean hunters’ paradise. But after seeing the green fire die, I sensed that neither the wolf nor the mountain agreed with such a view. I rarely cry at movies. But, when the callous Army troops killed “Two Socks”, the wolf who befriended Lt. Dunbar in Kevin Costner’s Academy Award film “Dances With Wolves”, my throat choked up and I cried. Likewise, when a native Alaskan told me how renegade hunters trespassed on her property and killed an aged wolf who had befriended her dog pups, I really got emotional. The wolf symbolizes many things to many people. To some, the wolf is a haunting reminder of a beautiful Nature when he and his family howl in the moonlight. To those who study ecology, the wolf has been shown to be a valuable top predator who helps maintain a healthy equilibrium in ecosystems. To others, the wolf is a tragic figure who is being slain in great numbers by trophy hunters. To the trophy hunter, his government legalizes and sanctions his need to boast about killing something in Nature. To the cattle rancher, the wolf is a threat to his economic well being. To the government employee who works with public lands, the wolf is simply a number to be controlled even though it has been shown that mankind cannot control Nature. That government official has the power to kill wolves ( they call it “harvesting” or “culling”) when the calculations suggest that a population is above some theoretical limit set by man. Add to that the strong political will that is exerted on that government employee by congressmen and senators whose election coffers are filled by hunting groups, gun advocates, and a huge population of ranchers. This confusing mixture of human opinions, emotions, and influence has resulted in many battles over who the wolf really is and his value in Nature. However, in 1995, a clarification of the wolf’s importance in Nature began to emerge. Wolves had once been the top predator at Yellowstone National Park. Due to man’s ignorance and greed, the Yellowstone wolf population was killed off in the 1920’s. This left the Yellowstone wilderness wolf-free for 70 years. A wolf reintroduction in the 1990’s at Yellowstone gave scientists a wonderful opportunity to study the changes that can take place when a top predator is introduced into an ecosystem. The returning wolves dramatically changed the equilibrium of the animal population, the rivers, and the forests. It is important to note that the wolf reintroduction was an act of passive restoration where mankind’s only role was in reintroducing the wolf. Everything else that followed was Nature taking her own course. A key finding, already known by theoretical scientists, was that everything in Nature is interconnected. The Yellowstone wolf reintroduction was proof, in Nature’s own living laboratory, that interconnectedness in Nature is vital to the functioning of ecosystems. The wolf is a key connecting force in Yellowstone’s ecosystem. 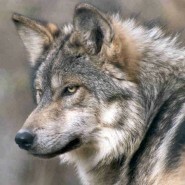 The removal of the wolf, and then it’s reintroduction, demonstrated the power and the value of the wolf’s role in Nature as well as the power of connections in Nature. Interconnectedness in Nature starts with depending on the sun for our energy that gives us life. That solar energy is first received by plants (remember photosynthesis in our high school biology class?). We and other creatures need to eat these plants to get our supply of energy. Like the wolf, we also get our energy by eating other creatures who eat the plants who receive energy from the sun. Everything, including we humans, is part of this interdependent food chain that becomes the conduit for energy flow so that all living plants and creatures may live . Interconnections of everything within all ecosystems can be defined as the energy flow processes that I just described. These connections are not always simple one-to-one relationships. Indirect interconnections that control entire ecosystems are known as “trophic cascades”. 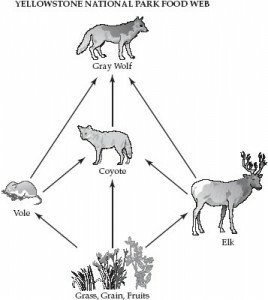 At Yellowstone, there is a three-tiered trophic cascade that involves wolves, elk, and the woody plants that the elk eat. When there are few wolves, the elk population increases and more of the woody plants along stream beds are eaten and become scarce. It has been noted that the reduction of these plants causes less soil stabilization along stream beds resulting in the re-direction of streams and rivers. In this process, the presence or absence of wolves can indirectly influence the routing of stream beds. When the wolf population is plentiful, more elk and deer are eaten. 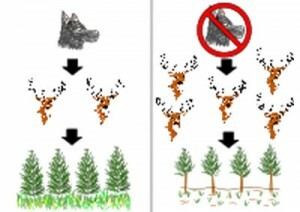 Consequently, there is reduced browsing pressure on these woody plants by the deer and elk resulting in fewer changes in stream beds.. Trophic cascades are the indirect and complex effects of changes in Nature’s energy flow. There are two wonderful videos that describe what happened when the wolves returned to Yellowstone National Park. I strongly recommend that you view “Lords Of Nature” and “How Wolves Change Rivers“. The Yellowstone wolf story is powerful scientific evidence that supports the important idea of interconnectedness in Nature. 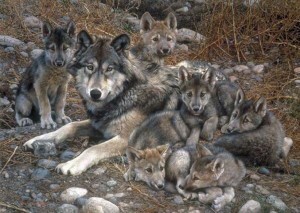 The study emphasizes the value of all top predators, including the wolf. But sadly, mankind’s political will, the economics of ranching, and the sick need to kill something are very strong forces. Government agencies continue to sanction these activities to the detriment of the wolf and the ecosystems that we humans are part of. Animals are being needlessly slaughtered and connections in Nature continue to be broken. Despite the negative side to the wolf story, people from ranches and governments are now beginning to recognize and accept the influential ecological role of the wolf in Nature. Non-lethal predator control is beginning to be used by ranchers in some areas. This video summarizes the recent history of the wolf, its relationship to the human population, and the practice of non-lethal control methods. There are still many ranchers and government agencies who kill wolves to protect livestock or to “cull” the wolf population. Sadly, there are still many who think that trophy hunting is necessary to satisfy some inner pathological urge to kill a living being. However, there is a side to this story that brings hope for the stability of our earth’s ecosystems. It is a story that comes from the wolf when he becomes our teacher and when we listen. It is the story of the wolf that can help us build a consciousness of how nothing exists in isolation — even a powerful predator like ourselves. We can learn this from the genius that surrounds us. Once we learn how and why we humans are connected to everything else, we build a “conservation consciousness” rather than becoming a destructive force. We become part of Nature, not apart from it. Like the wolf, we are a top predator who kills and eats. However, human predatory behavior is different. When there is less prey available to the wolf, he lowers the size of his family and his population to adjust for less food. The population of humans, on the other hand, continues to increase even when resources are less. 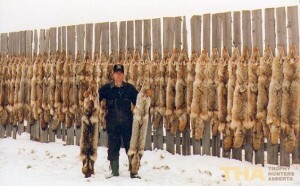 Wolves exercise population control, but we humans do not. In our indiscriminate wholesale killing of wolves (the government calls this “extirpation”), we have appointed ourselves as the top predator. 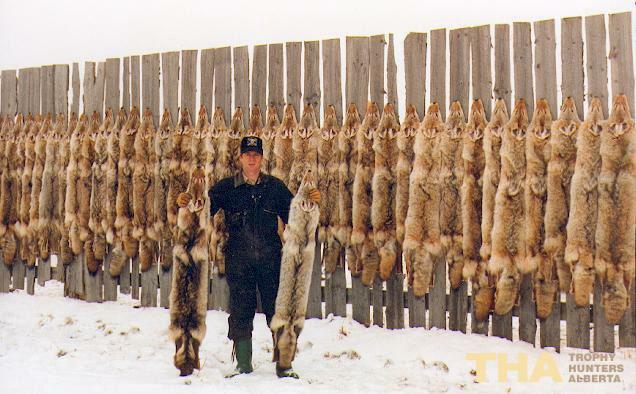 We fool ourselves into believing that our hunting rifles that kill both wolves and their prey are adequate substitutes for an interconnected natural predator/prey system. But, wolves do not extirpate and wolves are selective in who they kill for food. 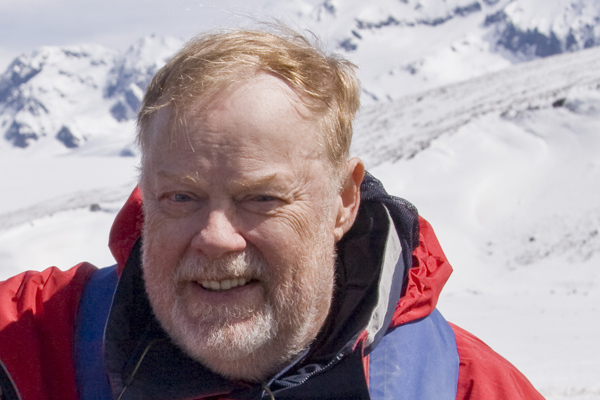 To survive on earth, we not only need to develop a consciousness for these interconnections, we must preserve these connections in order to survive. Top predators, like the wolf, help us preserve these connections by creating an equilibrium that allows everything to survive in a sustainable proportion that can connect to everything else. It is a sad fact that, as the most top predator on earth, we humans over consume and over populate. As such, we destroy Nature rather than achieve a constructive equilibrium. Wolves, as predators, do not destroy Nature. They achieve equilibrium in both population control and in consumption. The wolf teaches us the value of an interconnected and sustainable Earth. The third item in the credo represents a consensus of many scientists and educators. We adults represent the most destructive force on earth. Unless things change, the human population will ultimately go extinct. The trophy hunters and the greedy ranchers are icons that represent the destructive state of mind of many adult humans. The hope for we humans lies more with our youth than with our adults. Young people have fresh minds and a sense of awe and wonder. They have the potential to receive a positive message and build a consciousness. Like the wolf adults who mentor their pups, effective environmental education is a solution for a positive future. I believe that effective environmental education is hands-on and place-based where Nature becomes the living classroom. In my programs, I train the high school students to become the teachers of the younger students. 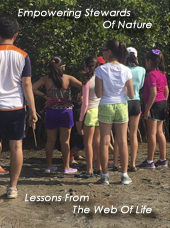 Also, a section of this blog site is devoted to environmental education by providing numerous teaching resources. A very powerful hands-on place-based environmental education program is operated by Deb Perryman in Elgin, Illinois. This video honors her work. In addition to her regular teaching/mentoring program, Deb mentors the student operated National Biodiversity Teach-In . As I continue to cruise cyberspace, I am discovering other powerful environmental educators. My hope for a growing human consciousness of an interconnected Nature has increased a great deal while camping all over the Pacific Northwestern United States during two months of the summer of 2015. During previous summers, I returned home disappointed by seeing lots of people in Nature glued to cell phones and ATVs without taking time to engage Nature. Sadly, it seemed that the parents were encouraging this behavior with their children. But, this summer, things seemed different. Like the wolf parents mentoring their young, I saw lots of parents with their children on Nature trails. Campgrounds seemed to be full of families who were directly engaging Nature. And, the US National Park Service visitor centers and tours in the Pacific Northwest were full of families. I came home from this summer greatly elated and encouraged. If only we were able to humble ourselves and pay attention, there are many fascinating facets to the wolf story from which we humans can directly benefit. These ideas are not just a string of metaphors. They are facts from which we can learn important lessons. “A Timely Message For All Beings“. Recently, I was asked to write an article for an online Nature magazine about the plight of wolves and how human beings are needlessly destroying their families and populations. I decided to pull together some of the information that I’ve developed in some of my published blogs. Ultimately, for technical reasons, I decided not to submit the article. Instead, I am offering this work in this post to my loyal blog readers. If some of the thoughts in this post are familiar to you, I am delighted and grateful because it tells me that you have been reading my other blogs on wolves as well as my thoughts on conservation. Hi Judy: Thanks for your great comment and the Omar Khayyam quote. The wolf is a keystone species not just from an ecological perspective, but as a basis for teaching about the vital importance of interrelationships in Nature. 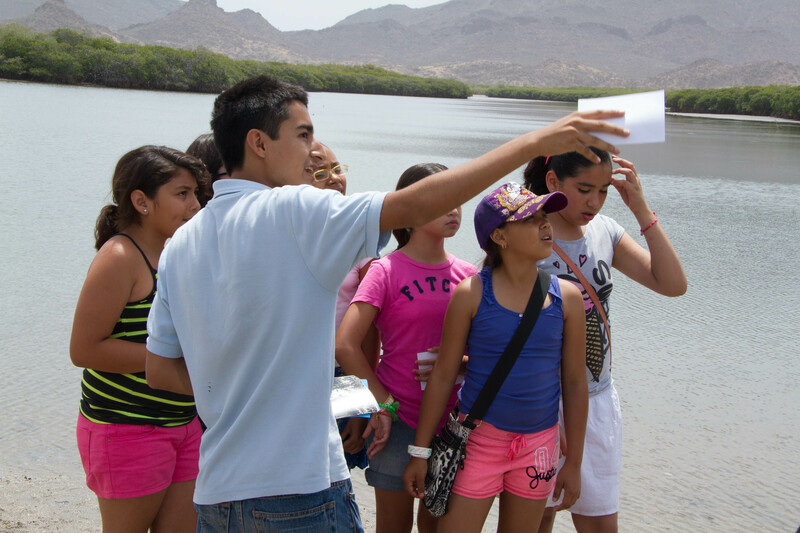 Education is a key conservation strategy. There are lots of examples and lots of research that has come out of the Yellowstone reintroduction. We have the information, but the political will of humanity is a very difficult hurdle to overcome despite the truth.